A felony criminal arrest warrant has been issued for Sandra Zemialkowski (Sandy Zemialkowski) in connection with Kali Soleil Athukorala's kidnapping. Sandra Zemialkowski is also being sought by federal authorities for Unlawful Flight to Avoid Prosecution. She has currently fled to the Dominican Republic to avoid prosecution for kidnapping Kali Soleil Athukorala. Sandra Clarissa Zemialkowski, also known as (aka) Sandra Clarissa Zemialkowski Rivera, aka Sandy Zemialkowski, pictured on the left, has kidnapped and is currently unlawfully retaining Kali Soleil Athukorala, a United States Citizen and resident of the Commonwealth of Massachusetts, in the Dominican Republic. Sandy Zemialkowski was last known to be unlawfully retaining Kali Soleil Athukorala at the home of Sandy's parents, Walter R. Zemialkowski and Clara Violeta Zemialkowski Rivera, in the city of Santo Domingo, Dominican Republic. Sandy Zemialkowski was last known to be working as a veterinarian at the Pet Land Veterinary Hospital in Santo Domingo, Dominican Republic. She appears in several promotional pictures for the hospital that are available through the hospital's spanish language website. In one picture she is pictured on the far right facing away from the camera along with the 'Medical Director' of the Pet Land Veterinary Hospital (in the red tie). She is also listed as a 'Doctor' working for Pet Land in the member directory of the Association of Dominican Veterinary Doctors (ADOMEVAM)'s website. This suggests that she may still be employed there. 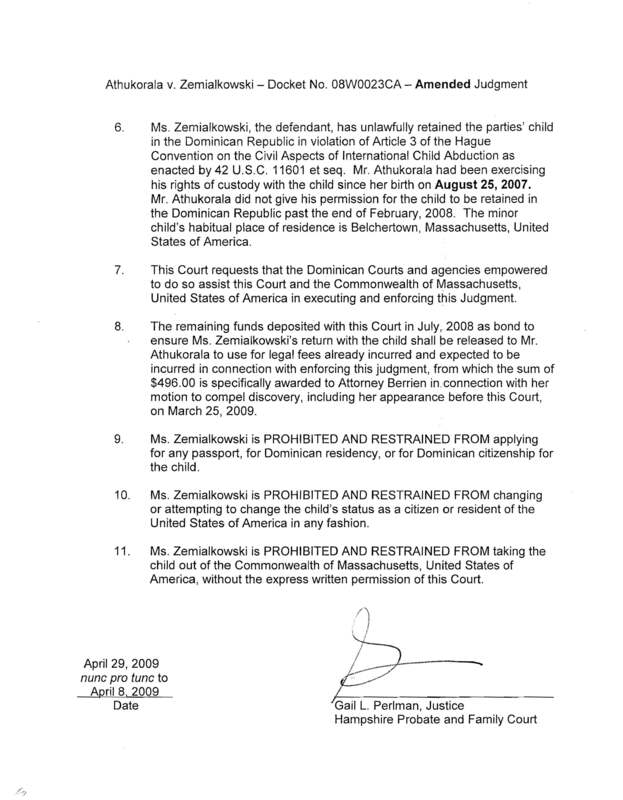 It is believed that Kali Soleil Athukorala, a United States citizen, is being unlawfully and wrongfully retained from her father in a house that belongs to Walter R. Zemialkowski and his wife in Santo Domingo, Dominican Republic. Walter R. Zemialkowski and Clara Violeta Zemialkowski Rivera are the parents of Sandra Clarissa Zemialkowski. Walter R. Zemialkowski is pictured below together with his wife Clara Violeta Zemialkowski Rivera. Walter Zemialkowski is a United States citizen and former member of the United States Air Force and is apparently either Director of Operations or Deputy Manager or both at the Punta Cana airport in the resort town of Punta Cana, Dominican Republic, which is run by Grupo PuntaCana. Ironically Mr. Zemialkowski as a former member of the U.S. Airforce took an oath to protect our nation and our citizens.